Wowzers!!!!! The FREEBIES just keep popping. Right now, there are 2 NEW Campbell's coupons that you'll want to print to score possible FREEBIES at Walmart. 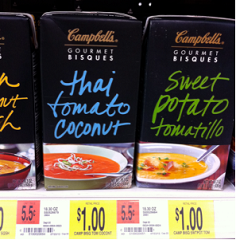 As you can see, Walmart carries the Bisque for ONLY $1, making it as low as FREE after coupons. Here's your chance to stock up!